After the death of his mentally ill wife, leprosy survivor Beshay decides to seek out his family. 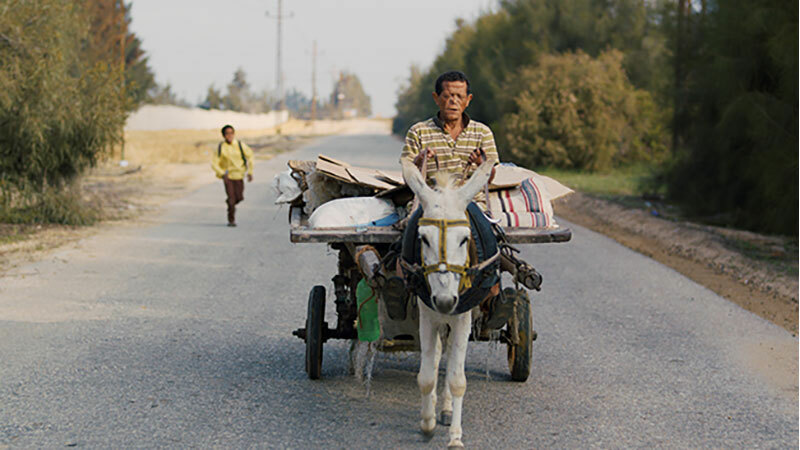 Having been abandoned at a leper colony outside Cairo as a child, his journey will involve travelling geographically southward with his reliable donkey Harby and the young stowaway orphan Obama, while addressing old emotional wounds. “The disease heals, but not the scars,” relates Beshay, and the filmmaker never flinches from showing the leper’s gnarled hands and disfigured face. This highly entertaining Egyptian road movie is essentially a character study, using non-professionals. While the travelers encounter fear and prejudice along the way, they also experience moments of kindness and unexpected grace. The film’s title means “Judgment Day,” and while the narrative confirms that all animals go straight to heaven, Beshay confesses “We live on the hope that on Judgment Day, we will all be equal.” Grounded in reality, Beshay also notes, “At least we got to see the world.” Dramatic, charming, and humorous at times, Egypt’s official entry for this year’s Academy AwardsÒ is an unforgettable humanistic film full of hope and life. In this sweet, intimate, and unpredictable film, androgynous Isfi joins rambunctious pals who plot a wild birthday surprise and experiences an overnight sleepover with a close friend named Nita. This brief but nuanced look at gender identity within a Muslim community won Best Short Film at the 2018 Venice International Film Festival for the Orizzonti section.